Blogging about bentos and my garden. I'll use this blog to practice my english. So if you find any odd grammar or words, feel free to correct me :) My bentos are usually not that special. I like vegetables without spices and I don't like sauces that much. Instead I'll try to make them interesting with edible flowers. My garden is feral, but I want to grow vegetables in it like we used to when I was a child. I also grow small vegetables and herbs on my balcony. 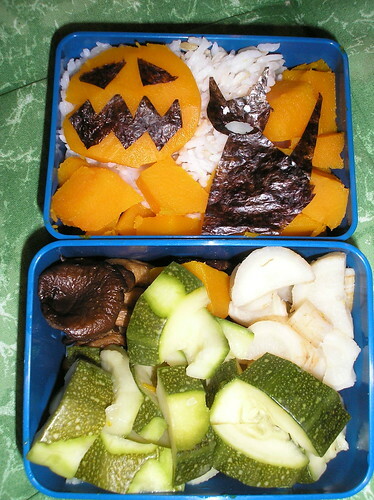 Halloween bentos wherever you look. So I made one too. Halloween isn't that popular around here. When I was a child, all I knew about Halloween was, that Charlie Brown is afraid of the great pumpkin. It gets more and more popular, but there are still few people who celebrate it. The top tier contains a Jack o' Lantern made of hokkaido squash and nori, a nori cat with cream cheese eyes and a parsley root mouth on top of rice. The bottom tier contains king trumpet mushroom, zucchini, parsley root and a piece of squash which didn't fit in the other tier. Half of the bento contains things I've never eaten before. I bought hokkaido squash because I've seen it in other bentos and wanted to try it. It smells a little bit like honeydew melon, which really surprised me. And I like it. Have to try out more. I also didn't eat king trumpet mushroom before. It isn't sold in stores and you rarely see it at the farmers market also. I actually wanted champignons, but I was late and there weren't many left and they weren't lookking, well, like they would say 'buy me'. I wasn't in the mood to look if another seller hat better ones and the seller also told me that shiitake and king trumpet mushrooms have a special price this week so I took those.I really don't regret it. They taste good ^.^ I just fried them in sesame oil and didn't add any spice to have just the taste of the mushrooms. Instead of the parsley root I wanted to get parsnip. But it was already sold out (did I mention I was late? ^^;). Parsley root looks the same, just a little bit smaller so I took it instead. I thought it tastes the same, but it doesn't. The inner part of a parsnip is a bit hard and doesn't taste that good (but maybe that's just true for the ones I got last time?). The inner part of parsley root is much bigger (maybe you can see it in the picture) and not ligneous at all. And it was somehow sweet. I like parsnip, but I like parsley root a lot more. Edit: I almost forgot this month's B.O.M.B. Yes, it is so much fun. And there are so many things, I didn't try yet. Or some I haven't eaten for a long time.